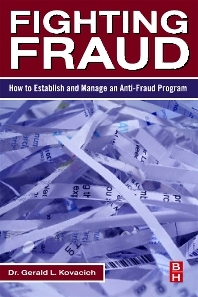 This practical reference provides the basics for instituting a corporate anti-fraud program that helps prepare corporate security professionals and other corporate managers for fighting corporate fraud from inside the company. Fighting Fraud provides an exceptional foundation for security professionals or business executives involved in developing and implementing a corporate anti-fraud program as part of a corporate assets protection program. The author’s intent is to provide the reader with a practitioner’s guide (a “how-to” book), augmented by some background information to put it all in perspective. The approach used should enable the readers to immediately put in place a useful anti-fraud program under the leadership of the corporate security officer (CSO), or other corporate professional. Chapter 2 Corporate Assets, Frauds and Other Terms — What are They? Are Defrauders a Product of Their Environment, or is it in Their Genes? Chapter 5 Fighting Fraud — Whose Job is it Anyway? Hackers, Crackers, Phishers, Oh My! What is Risk Management As It Relates to IWC's Anti-Fraud Program? Chapter 13 Are We Winning the Battle? How Do We Know? Chapter 14 What Will the Fraudulent Future Hold for Corporations?